A lot is happening in Contest of Champions right now. To build off of the excitement surrounding Avengers: Infinity War, the game has brought in two new characters specific to the movie. Along with two events and a challenge based around Thanos and Infinity War. 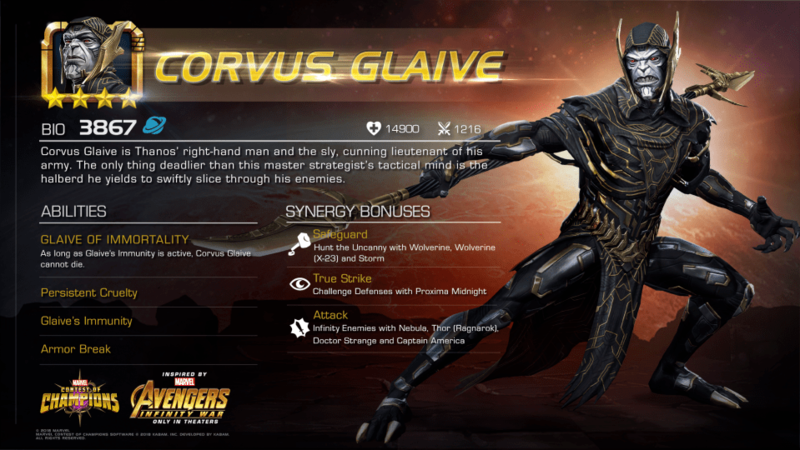 Corvus Glaive, the fierce lieutenant to Thanos has recently entered the Battlerealm. He is a strong fighter that should not be underestimated. His abilities include Glaive of Immortality, Persistent Cruelty, Glaive’s Immunity and Armor Break. 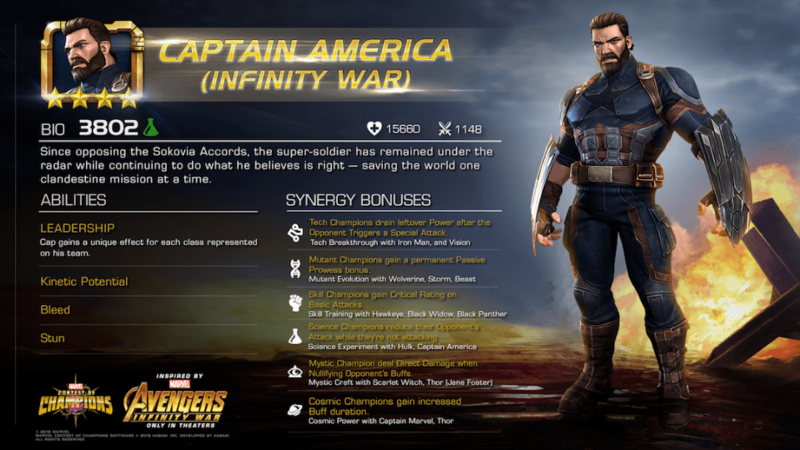 Captain America in his Infinity War uniform entered the game on May 10th. He has the muted suit, beard and the new vibranium vambraces for shields. Some of his abilities are Bleed, Stun, Fury, Kinetic Potential. 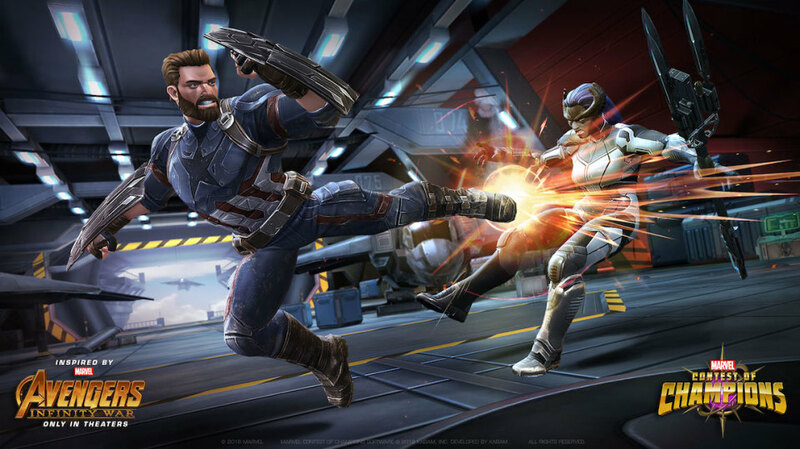 Captain America’s new shields allow him to store up to five Kinetic Potential charges. One of the new story lines that has started is called “Trials of the Mad Titan”. It started April 25 and ends June 6. In this story line the Infinity Stones are scattered throughout the Battlerealm. The stones leave “pockets of their condensed energies ripe for the picking.” Each day the player will have the opportunity to battle enemies infused with power from the stones. Collect Boosts if you can to temporarily gain access to the powers of each stone. 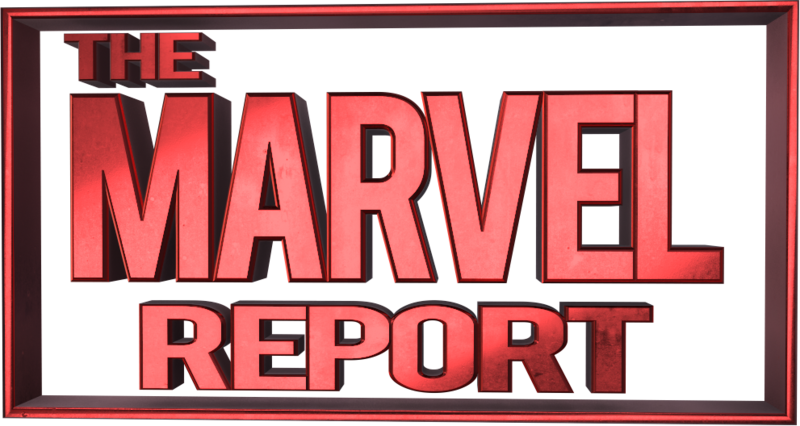 The next Infinity War inspired event to participate in is called “Infinity Nightmare”. This event goes from May 2 to June 6. 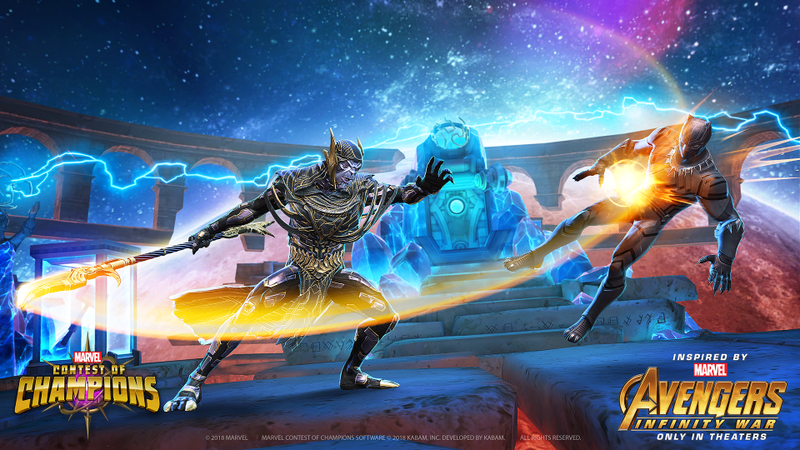 This event centers around the idea that Thanos has won and with his supreme power make a decree, “NO MORE GAMES. THE CONTEST OF CHAMPIONS IS OVER.” The heroes flee to the Astral plane where they are followed by the Black Order on a mission to kill all heroes. M.O.D.O.K, Mephisto, and free champions led by Iron Man and Captain America form an uneasy alliance to fight Thanos. You are part of the resistance. Lastly, there was a challenge put up by Chadwick Boseman and Tom Holland. It is a champion challenge that earns you the title of “Infinity Warrior”. It ended May 17.